Just in time for summer reading comes this multifaceted thriller: part historical fiction, gripping spy tale, period novel of the 1930s, and inside look at the political intrigue that ended World War II. Red Joan is inspired by the real-life Melita Norwood, unmasked in 1999 at the age of 87 as Britain’s longest serving spy for the KGB. Improbably, Joan possesses two qualities that let her get away with it: she is a woman, culturally innocuous at the time, one whom no one would suspect of intrigue; and she holds a newly minted degree in physics from Cambridge University. The famous Cavendish lab at which works—making tea and typing in addition to her scientific duties—is in a race with the Yanks, the Germans, and the Soviets to perfect the weapon that will end the war: the atomic bomb. So poised, Joan gives in to her idealism and delusions. Temperamentally guileless and prone to self-deception, she willfully overlooks warning signs in her work and her personal life. She persuades herself that Leo, Russian-born and staunch defender of communism, is as much in love with her as she is with him. After the horror visited on Hiroshima, she believes that the Soviets will be attacked next. In her mind, passing on technical details about the bomb––“sharing, rather than stealing,” she tells herself––will make the balance of power “fair.” Despite having signed Secrecy Act documents, she believes her treason will serve a higher purpose by contributing to the greater good. She is not entirely alone in her idealism so much as extreme in it. The British physics team tends to focus its thoughts on peaceful uses of nuclear power rather than its cataclysmically destructive force. She believes she can read others, while blind to being manipulated by Leo, comrades, and those she believes to be close friends. “How strange the human mind is, she thinks. “Unknowable and unpredictable, its thoughts whizzing like electrons inside an atom. Invisible to the human eye.” What is invisible to Joan are the machinations and intrigue around her. So is the corrosive effect on one’s conscious of keeping secrets. 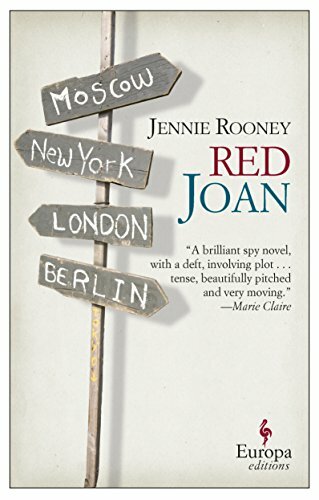 For some readers the science of Red Joan will resonate; for others, the politics will hold their interest; others still will find both story lines equally thrilling. Characters are complex and well drawn, and the author lets us in on their convictions, prejudices, and doubts.